How to take advantage of a Leveraged ESOP for your business. Leveraged ESOP (Employee Stock Ownership Plan) Transactions are They Too Good to be True? For a number of reasons, leveraged ESOP transactions have become popular for privately-held, middle market companies. As the public capital markets constricted over the last several years, and the field of financial buyers narrowed, middle-market companies began to see the leveraged-ESOP transaction as a great alternative strategy to a conventional sale transaction as a means to create “tax-free” liquidity and diversification for their shareholders. Because these middle-market companies were finding few interested outside third-party buyers, the founders of these companies discovered that (1) they could “create” a purchaser for a “fair market value” sale of their stock, (2) remain in control of their business following such a sale regardless of the amount of stock sold to the ESOP, and (3) pay no capital gains taxes on the sale of the stock when they used the proceeds of the sale to buy a better-diversified portfolio of publicly-traded securities (thereby reducing their risk profile). The leveraged-ESOP transaction literally “creates a market” for the stock of the privately-held company, and permits the company to finance the transaction with tax-deductible contributions, even while the founder-shareholders pay no taxes on the capital gains from the sale. Does this strategy sound too good to be true? It’s not. But it’s not for every company either. Some industries and some company structures are better ESOP candidates than others. There are many variables and issues to consider along the way that affect the structure of the transaction, but the experience of our attorneys at Delashmit Law LLC gives you an advantage in squeezing the most benefit out of the transaction, while addressing corporate governance concerns and other related issues. In the following summary, we describe generally the structure of a typical leveraged ESOP transaction, a common “Candidate Profile,” some of the advantages of a leveraged ESOP transaction, and some of the complications of an ESOP transaction. An ESOP (or Employee Stock Ownership Plan) is a qualified, defined contribution employee benefit plan created by the employer-company that invests primarily in the stock of the employer-company. The term “leveraged” (as in other transactional contexts) describes the financing of the transaction with debt. Typically, the company borrows from a commercial lender some or all of the funds required to purchase the stock, and the loan is secured by the assets of the business. As described in more detail below (see, How Does it Work? ), the company then loans the proceeds to the Trust (the employee stock ownership trust created by the company as a trust fund for the employees to buy the stock. 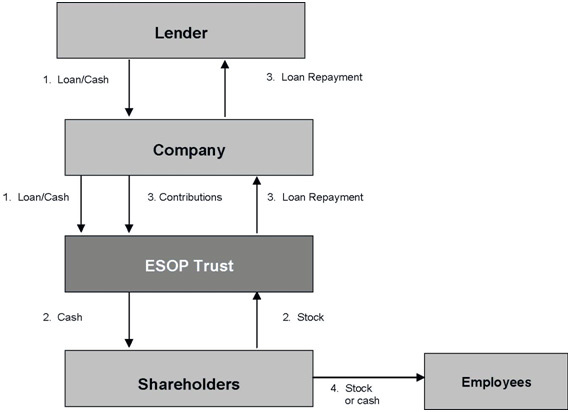 The ESOP uses the proceeds of the loan from the company to purchase the stock from the founder-shareholders for the “fair market value” of the stock as determined by an independent valuation. The ESOP uses the annual contributions that the company makes to the ESOP to repay its loan from the company. Because those annual contributions are deductible (subject to certain limits), the company, in effect, is able to deduct fully not only the interest but the principal as well on its loan from the commercial lender. The ESOP is a “home-grown,” fair market value purchaser with the additional advantage that the people most responsible for the success of the company (the employees) are the purchasers-participants. What is the Primary Advantage of a Leveraged-ESOP? The jewel of the ESOP for privately-held companies is the ability to use tax-deductible corporate earnings to fund the ESOP’s purchase of stock. The founder-shareholders are able to sell some (or all) of their stock while postponing indefinitely the capital gains tax on the sale proceeds. Unlike an outright sale to other third parties, the founder-shareholders retain, if they desire, full operational control of the company, while at the same time cashing-out some of their equity that is tied-up in their single-largest investment, their company. A founder has described the transaction as “using Uncle Sam’s money to buy me out tax-free.” As a result of the ESOP, the company provides its employees with a valuable retirement benefit. As owners of the business, the employees become more productive, thereby increasing the value of the business. • The corporation “creates” a ready market for its stock (by creating the ESOP purchaser). • The corporation can finance the transaction with “pretax” dollars. The corporation receives a deduction for its contributions to the ESOP that are used to pay both principal and interest on the loan. Contributions to the ESOP are tax-deductible for a C-corporation leveraged-ESOP up to 25% of eligible payroll, plus all contributions to pay interest on the loan (if not more than 1/3 of the contributions are allocated to the accounts of “highly compensated employees”). • The corporation receives a deduction for the dividends paid on employer securities used to repay the ESOP loan or paid to participants. • An ESOP can borrow or acquire stock from related parties, such as major shareholders (otherwise prohibited for most qualified plans). • The founder-shareholders (as sellers of nonpublic employer securities to the ESOP) are not taxed on gain realized on the sale to the ESOP if specific rules are met (commonly referred to as the “1042 roll-over” referring to the controlling provision of the Internal Revenue Code Section 1042). These rules include, among others, a requirement that the ESOP must own 30% of the corporation’s stock after the sale, and the seller must purchase “qualified replacement property” (or QRP) within 12 months after the transaction closes. This technique allows the gains from a sale to an ESOP to be reinvested (or “rolled-over”) into publicly-held securities (achieving diversification and liquidity for the selling shareholders). The gain is untaxed until such securities are sold. Furthermore, the sellers may be able to take advantage of a “margin loan” against the QRP (for certain types of variable-rate notes) of up to 95% of the value of the notes. The sellers have, thereby, deferred the gain, but have access to the majority of the cash value for other purposes. • The founder-shareholders may sell to the ESOP a portion of their stock (typically at least 30% collectively, in order to take advantage of the Section 1042 roll-over described above), remain in operational control of the corporation, and sell the remainder of their stock in stages over an extended period of years to allow the founders to gradually transition the management of the business to the next generation of management. • The corporation receives a tax deduction for the fair market value of employer securities contributed to the ESOP. • Employee performance and job satisfaction may be improved by creating an “ownership” corporate culture (employees are regarded as, and consider themselves, “co-owners” with the founders-management). • A significant employment benefit/incentive is created that is tied directly to the success and performance of the business, aligning the interests of employees and management. It can be an important source of compensation and retirement benefits for employees to participate in the future growth, earnings and dividends of the employer. • A leveraged ESOP may be used to facilitate a leveraged buyout. • Non-callable preferred stock may be used in an ESOP (if it is convertible at any time into common stock) to increase the value of the shares sold to the ESOP. • Through proper structuring and communication, an employer may be able to reduce the costs of other benefit programs by implementing the ESOP. 1. The company establishes a trust for the benefit of the employees referred to as the ESOP Trust. The bank makes a loan to the company, which in turn lends the funds to the ESOP Trust, secured by the stock being purchased by the ESOP Trust from the founder-shareholders. 2. The ESOP Trust buys stock from the founder-shareholders and holds it in a suspense account. 3. The company makes yearly tax-deductible contributions to the ESOP, which in turn uses those contributions to repay its loan from the company. As the debt is paid down, shares of stock (proportionate to the amount of the loan repaid) are released from the suspense account and allocated to individual employee accounts. 4. Employees become vested in their accounts (typically over a period of 6 years) if they remain employed by the company. The employees receive distributions of their vested account balances (in stock and/or cash) when they retire or otherwise leave the company. Is a Leveraged ESOP Right for our Company? The typical candidate (“Candidate”) for a leveraged ESOP transaction is a stable but growing, middle-market business, with a capacity to borrow money for its operations. Because of the costs associated with a leveraged ESOP transaction the Candidate should have annual adjusted EBITDA (Earnings Before Interest, Taxes, Depreciation, and Amortization) of more than $1,500,000, with founder-shareholders interested in creating tax-free liquidity and diversification for the founders. The Candidate commonly employs a significant work force of more than 20 employees, with an “eligible payroll” of more than $1,000,000 (because the amount of the eligible payroll is an important factor in the benefit planning). Contributions to the ESOP are tax-deductible for a C corporation leveraged ESOP up to 25% of eligible payroll, plus all contributions to pay interest on the loan (if not more than 1/3 of the contributions are allocated to the accounts of “highly compensated employees”). The Candidate should have strong management (including successor management if the founders are retiring and exiting the business), a good business plan, stable and recurring free cash flow, a good debt structure and sufficient collateral to secure the senior-debt, asset-based credit facility. We have successfully closed leveraged ESOP transactions for companies in manufacturing (apparel, electronics, consumer goods), distribution, transportation, construction, automobile dealerships, as well as professional organizations such as architecture and engineering firms, physician practices and other service providers that once were unlikely candidates (commercial lenders were not fond of service receivables as collateral for the leverage component, but we are seeing more competition now – and the transactions may be primarily seller-financed as a succession planning approach if a commercial lender is not participating). What are the Complexities of a Leveraged ESOP Transaction? • There are numerous special rules applicable to ESOPs under the Internal Revenue Code and ERISA, including detailed and complex loan rules. Transaction specialists and experienced professional advisors are a necessity. • The complexities of the transactions require the participation of numerous professionals, including: legal counsel for the company, the lender, and the corporate trustee; a corporate fiduciary or trustee representing the ESOP Trust purchasing the shares; financial advisory firms arranging financing; accountants; and one or more independent valuation firms. There are significant transaction costs associated with the transaction, so that the minimum transaction size should be $5,000,000 or more. • An initial independent appraisal of non-publicly traded securities is required and annual independent appraisals are required thereafter. • The company generally needs the assistance of outside specialists to provide recordkeeping and administrative services in order to comply with a complex set of rules regarding contributions to the ESOP, repayment of the loans, release of stock from the suspense account, allocations to employee accounts, distributions, forfeitures by departing employees, diversification for senior employees, repurchasing obligations, and other matters regarding the participants’ accounts. • The regular reporting and disclosure rules of ERISA apply to ESOPs. • Pass-through of voting rights is required for ESOP participants under specific circumstances, such as consideration of a merger or consolidation, recapitalization, classification, liquidation, dissolution, or a sale of substantially all of the assets of the company. • Employee direction of investment of accounts for older employees is required generally starting when a participant attains age 55 and has 10 years of participation in the ESOP. • Distributions are required to be made in employer securities, and put options are required for distributions of nonpublic securities (the employee is entitled to sell back the stock to the corporation, and the corporation is required to repurchase the stock, at its fair market value as determined by an independent appraisal). • If not properly managed, the sale to an ESOP of closely-held employer securities may be re-characterized as a constructive dividend. • Creation of an ESOP could result in loss of voting control of a company by the controlling shareholder on specific issues that require a pass-through vote of the participants, or after conversion of ESOP stock to common stock (typically the ESOP stock is a convertible preferred stock). • Employee-shareholders acquire some rights to information regarding the corporation, and management undertakes fiduciary duties on behalf of a new class of shareholders of the company (this reality can present a challenge to a closely-held business run by a single shareholder or small group that is accustomed to making operational decisions without regard to any other interests). • Typically the corporate fiduciary serving as trustee for the ESOP Trust will require certain operational limitations on the authority of the managers, including salary and bonus limitations indexed for inflation. • Future legislation can change rules and limit benefits. A leveraged-ESOP transaction can be an excellent, alternative strategy to a conventional sale transaction as a means to create “tax-free” liquidity and diversification for the shareholders of a privately-held company, in the right circumstances. If you would like to consider whether an ESOP may be right for your business (or if you just want more information), please contact DELASHMIT LAW FIRM LLC at the address below.